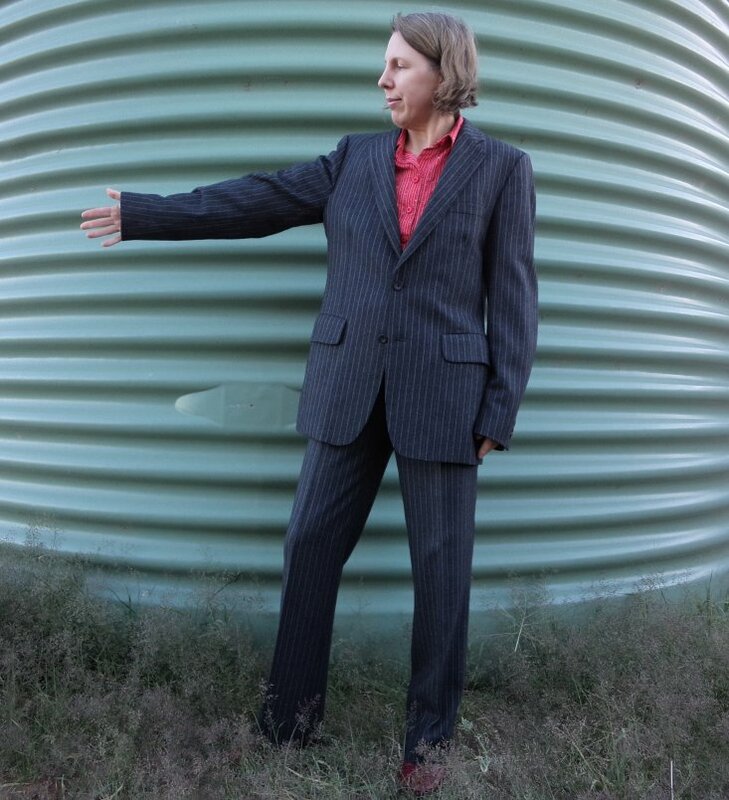 Remember the Aquascutum suit I found in a op shop? Read about my bargain purchase here. 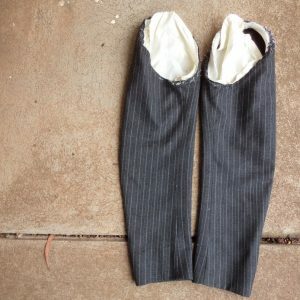 The trousers fitted perfectly and I had plans to remodel the jacket. I got as far as unpicking the sleeves and pinning in the body (and was reminded how hard it is to fit oneself). Then we had a heatwave and I lost interest in it for several weeks. Now that autumnal leaves are falling and the season is gently changing, my sewing priorities have changed and I got it out again. I tried to do as little as possible to the jacket, since I didn’t have the energy, time or inclination for a full Vogue re-cut as per my original post. I gave it some waist shaping to give the illusion of a waist, took in the side back panel, and narrowed the shoulders. 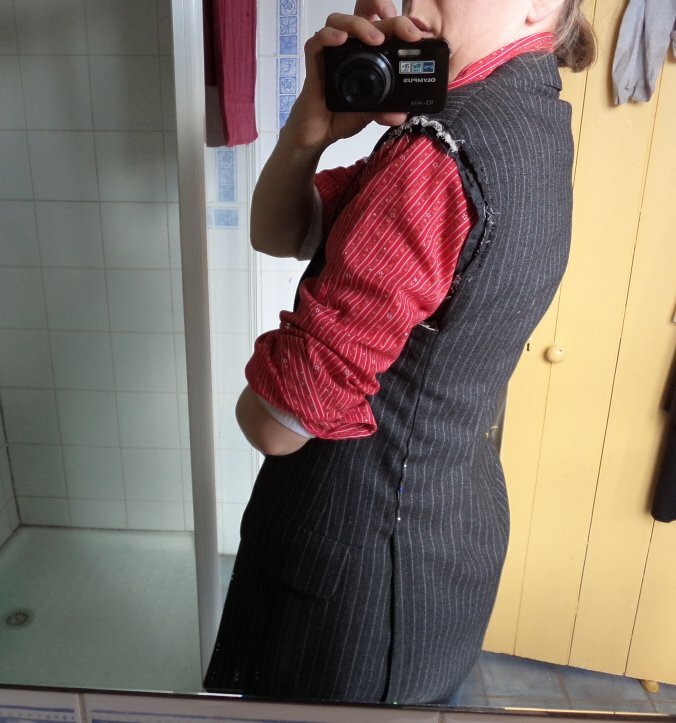 Most jacket lengths look ok on me, so I’m leaving the length for now. The sleeves are lined in white taffeta. 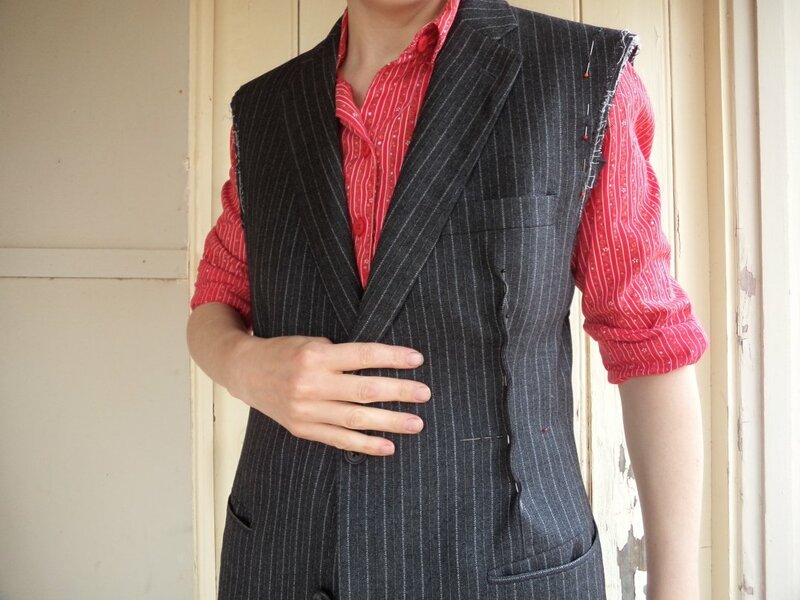 It doesn’t bother me cutting and remodelling a jacket that’s 50 years old. The jacket has already had two significant alterations (it has been let out twice, according to the stitching holes in the lining) and the trousers have been taken in at the centre back and seat. I’m just the next person altering it to fit. 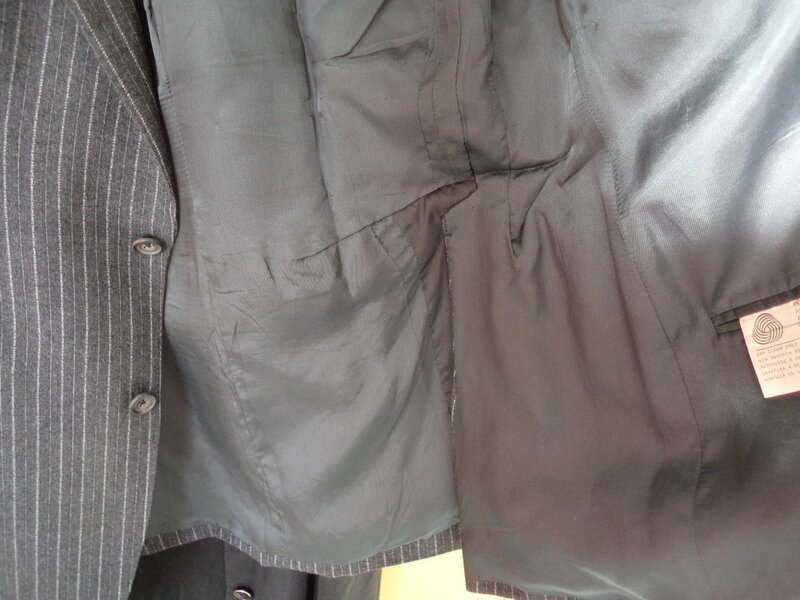 The jacket was let out so much that extra lining had to be added at the back flaps. I don’t know if you feel the same way about these things, but I was looking forward to undoing the jacket so I could see the “behind the scenes” structure. The bathroom mirror shot. Not keen on the way the flaps sit slightly opened, but there’s not much I can do about it. 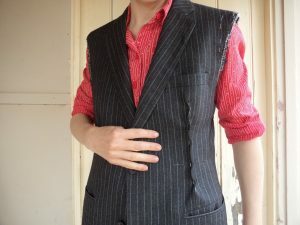 On the weekend I sewed in the changes I’d pinned (and wasted an hour mucking around adding shoulder darts because I thought I needed them – I didn’t; it was fine how it was). 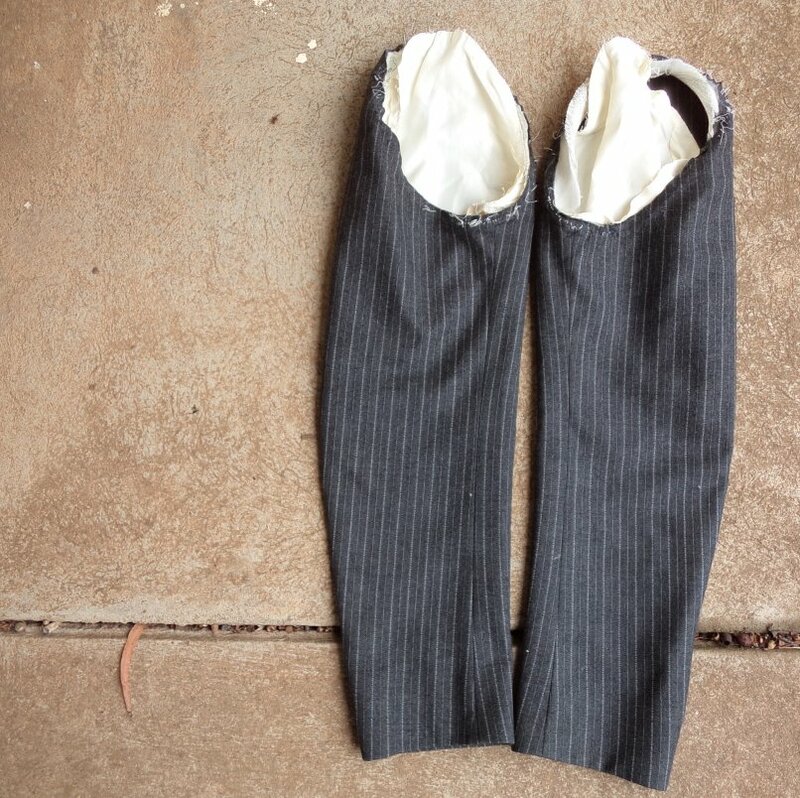 Unfortunately all the changes had to be accessed through the armholes, however, the fabric is easy to work with, presses like a dream, is very pliable and doesn’t go shiny when pressed. Funnily, I don’t mind the jacket without sleeves, in an arty sort of way. I will put them back, though. I’m leaving the shoulder pads out and just having a natural shoulder line. The armhole is a bit lower than I’d like. Trimming down and attaching the sleeves will be a matter of trial and error, but I’ve done lots of sleeves and I’m quietly confident it won’t be too hard. 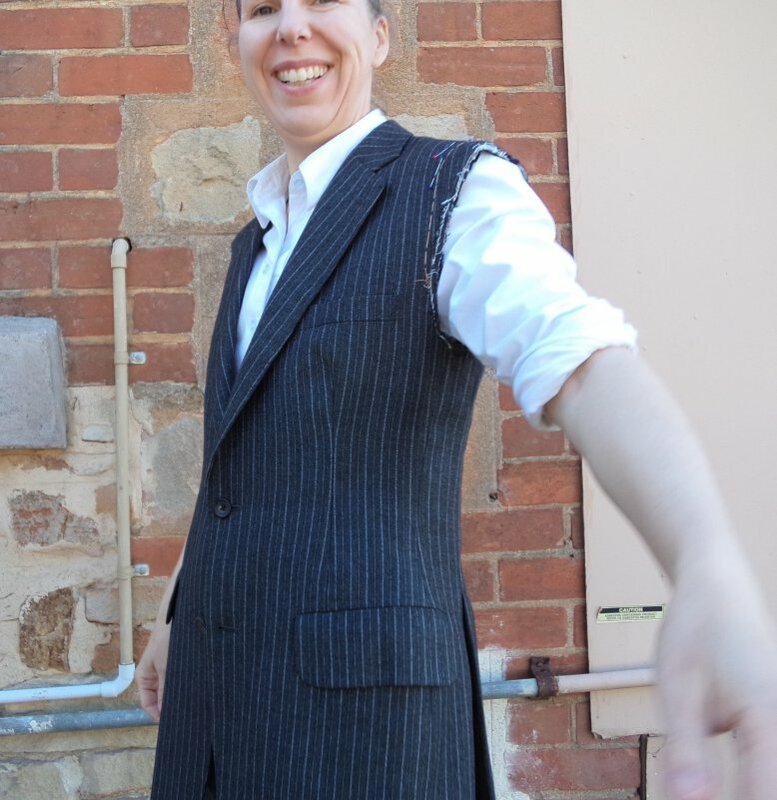 I’m thinking I’ll need either an ultra-feminine blouse (front bow or frills…or both) or a funky top to wear with it. Don’t want to get mistaken for a lad! Many thanks Viv. Must be all those creative women I grew up around!